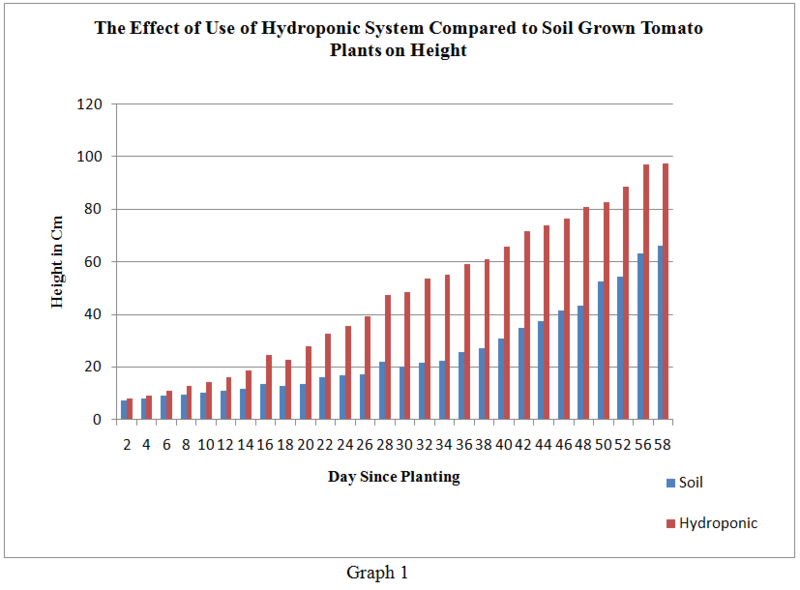 1 What is Hydroponics and How Does It Work? It can be very confusing to get started in hydroponics. Figuring out how it all works, how to choose a system, what to grow, and even HOW to grow are all challenging. This is a long and in-depth article, so if there’s a particular section you’re curious about, just use the table of contents below to skip to your desired section. Otherwise, read on! 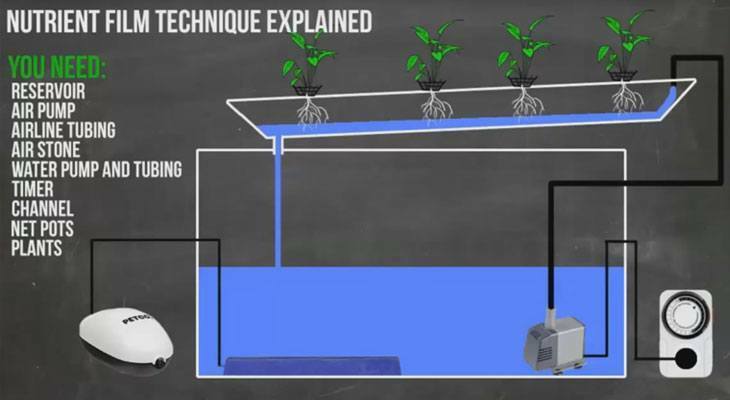 What is Hydroponics and How Does It Work? Instead of soil, hydroponic gardeners use different types of growing media, like coconut coir, vermiculite, perlite, and more. In a nutshell, the idea behind hydroponics is to remove as many barriers as possible between a plant’s roots and the water, oxygen, and nutrients it needs to grow (and thrive). This can be done in many different ways, which is why we’ll look at the different types of systems you can use to grow hydroponically — but first, let’s understand the benefits and downsides of growing without soil. This happens because you’re making it easier for them to get the nutrients they need to grow. When they have to struggle less to find pockets of water or nutrition like they would in soil, they can divert that energy to growth. It’s important to keep in mind that you only enjoy these ​benefits if you set up and maintain your hydroponic garden carefully. The biggest downside of hydroponics is the cost of buying a system. However, it’s my aim to teach you how to build most of these systems yourself if you want to, which can reduce the cost. Another negative is the experience required to run a system successfully. It’s not THAT hard, but it’s certainly more difficult than growing the same plant in soil. This is because you are creating an artificial environment where you provide the water, nutrients, light, and everything else the plant needs — which means you also need to monitor those inputs. A wicking system is the most basic type of hydro system you can build. It’s been used for thousands of years, though it wasn’t considered a hydroponic system back then. It’s what’s known as passive hydroponics, meaning that you don’t need any air pumps or water pumps to use it. Nutrients and water are moved into a plant’s root zone via a wick, which is often something as simple as a rope or piece of felt. One key to success with a wicking system is to use a growing media that transports water and nutrients well. Good choices include coconut coir, perlite, or vermiculite. Wick systems are good for smaller plants that don’t use up a lot of water or nutrients. Larger plants may have a hard time getting enough of either via a simple wick system. 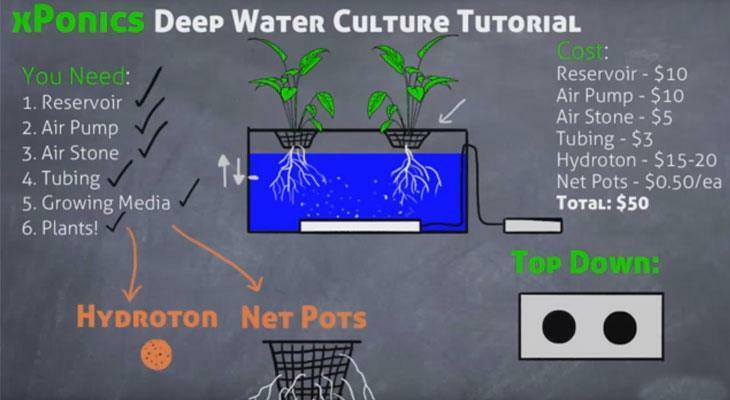 How a Deep Water Culture (DWC) system works. 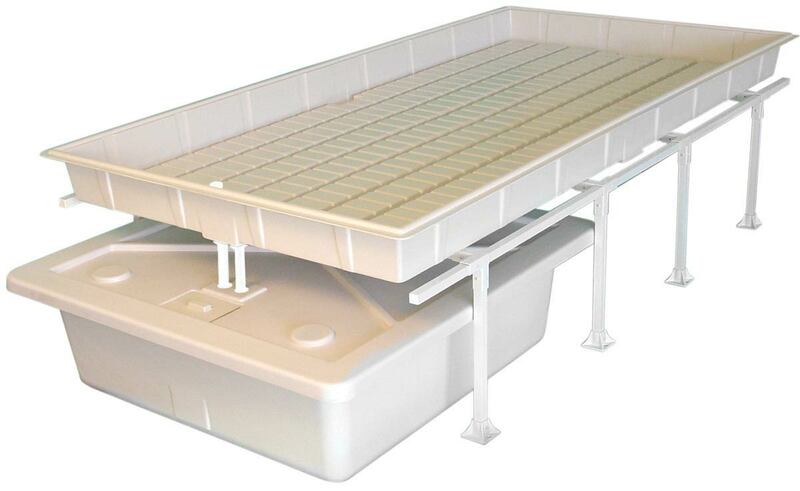 In a DWC system, you use a reservoir to hold a nutrient solution. The roots of your plants are suspended in that solution so they get a constant supply of water, oxygen, and nutrients. To oxygenate the water, you use an air pump with an air stone to pump bubbles into the nutrient solution. 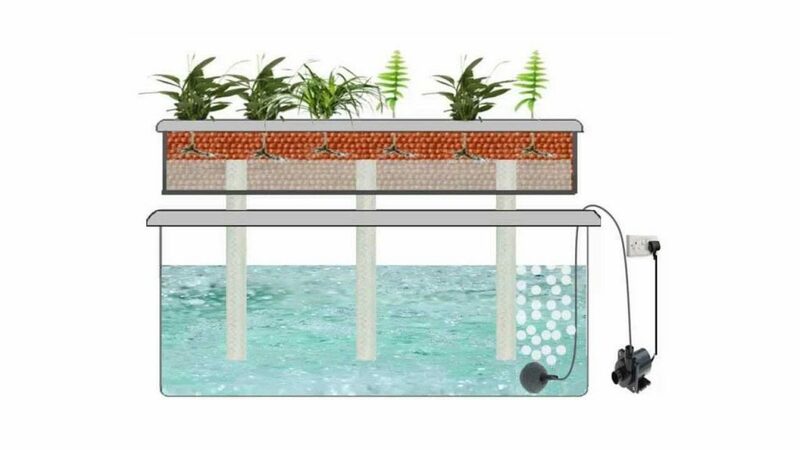 This prevents your roots from drowning in the water — a weird thing to think about, but it can (and does) happen to many beginner hydroponic gardeners. The simplest way to set up a NFT system. Plants are grown in channels that have a nutrient solution pumping through them and constantly running along the bottom of the channel. When the solution reaches the end of the channel, it drops back into a main reservoir and is sent back to the beginning of the system again. This makes it a recirculating system, just like deep water culture. Ebb and Flow systems, which are also known by the name Flood and Drain, are a less-commonly seen system. But they’re still quite effective and can be the best choice depending on your situation. Unlike the previous two hydro systems we have covered, an ebb and flow system does not expose the roots of your plants to nutrient solution on a constant basis. Flooding is accomplished by using a reservoir below the tray, a water pump, and a timer to schedule the flooding cycle. After the tray is flooded, gravity drains the solution back down into the reservoir, where it is being oxygenated by an air pump and air stone. It sits there waiting for the next flood cycle, and the process goes on. 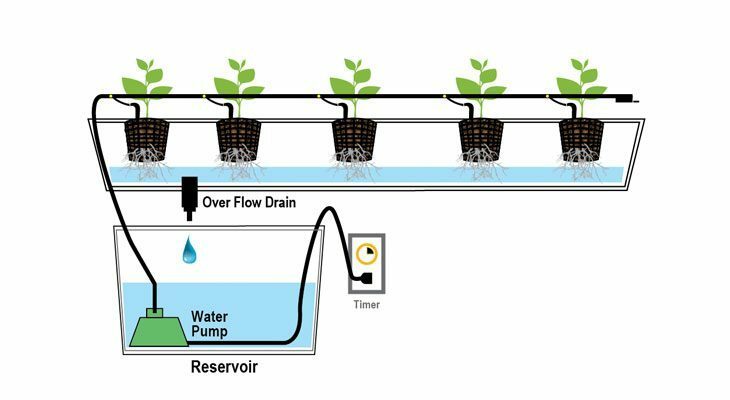 Hydroponic growers choose ebb and flow systems for their flexibility. Most of them will fill the tray with a growing medium of their choice and also add net pots to organize their plants and control the roots a bit more. A simple aeroponic system you can build at home. 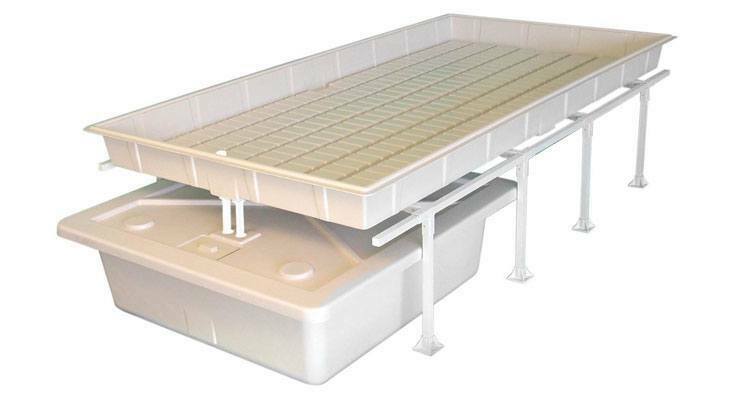 An aeroponic system is similar to a NFT system in that the roots are mostly suspended in air. The difference is that an aeroponic system achieves this by misting the root zone with a nutrient solution constantly instead of running a thin film of nutrient solution along a channel. 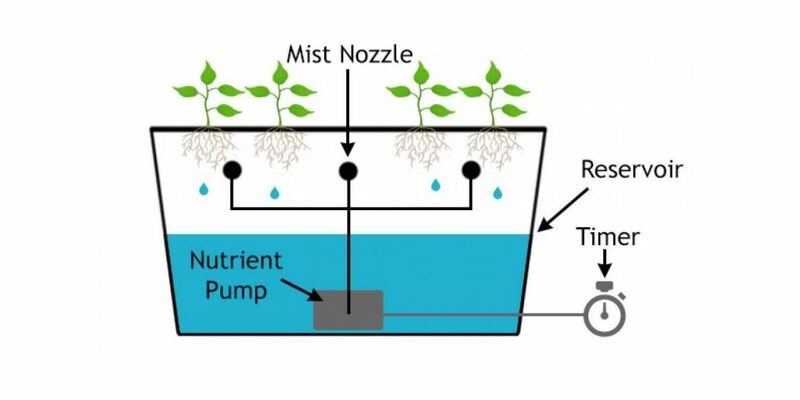 Some growers prefer to mist on a cycle like an ebb and flow system, but the cycle is much shorter, typically only waiting a few minutes between each misting. It’s also possible to mist on a continual basis and use a finer sprayer to ensure more oxygen gets to the root zone. Aeroponic systems have been shown to grow plants even quicker than some of the simpler systems like deep water culture, but this has not been verified to be true in all cases. If you want to experiment with this system, you will need specialized spray nozzles to atomize the nutrient solution. A basic hydroponic drip system. Well, there you have it. The six major types of hydroponic systems, how they work, and the ups and downs of each one. No matter which one you choose, your plants will grow fast and big provided you care for them properly. Hydroponics offers amazing flexibility, so even if you’re experiencing some troubles, you should have no problem correcting them and getting your plants back on track.